Tune in to hear Garrick Brown, author and speaker on real estate for the retail sector, discuss the most important trends for 2016. This 45-minute webcast will feature Garrick’s perspective, including a short Q&A. The audio and presentation will be broadcast on the web. Hear Ben Conwell; our eCommerce Fulfillment Practice Group Expert (and former Amazon N. American Operations Real Estate Director) and Garrick Brown; our Head of Retail Research for the Americas, explore the impact of the holiday shopping season and eCommerce, and relevant trends and data points affecting what’s in store for supply chain and brick-and-mortar retail in 2017. • For most of his campaign, U.S. President Donald Trump vowed to make sweeping changes in the U.S. What are the priorities of the Trump administration and how will they make an impact? • How much of the proposed fiscal policy will be accomplished in 2017 and beyond? What opportunities or risks will be available for commercial real estate? • What will the workforce and workplace look like this year? As labor markets reach full employment, learn which markets have the workforce to fulfill today’s occupiers' need. Please join Cushman & Wakefield's Kevin Thorpe and Ken McCarthy as they discuss the Federal Open Market Committee’s December interest rate decision and path forward as well as what it means for commercial real estate fundamentals. The eCommerce Impact on Supply Chain and Brick-and-Mortar Retail— Predictions and Insights from our Industry Experts. Hear Ben Conwell; our eCommerce Fulfillment Practice Group Expert (and former Amazon North American Operations Real Estate Director) and Garrick Brown; our Head of Retail Research for the Americas, weigh-in on valuable trends and data points associated with the biggest shopping time of the year and what we can expect in 2016 and beyond. In this webcast we will provide the latest quarterly update to the Cushman & Wakefield Fair Value Index™ and reveal those markets which look most attractive for investment. We will also touch on Brexit risk and the implications for real estate. • Will global headwinds derail the U.S. economy and industrial sector? • How exposed is the U.S. economy to China and what industries are at the greatest risk? • Can U.S. manufacturing rebound and grow in the current environment? • Which industrial markets are the most recession-resilient? • Will the industrial sector's hot streak continue in 2016? In this webcast we will provide the latest quarterly update to the Cushman & Wakefield Fair Value Index™ and reveal those markets which look most attractive for investment. We will also touch on the impact of the drop in the oil price and financial market volatility since the turn of the year. 2015 saw European investment activity surpass its previous peak in 2007, but was Q4 activity as strong as expected? Join Nigel Almond, Head of Capital Markets Research and Magali Marton, Head of EMEA Research, to discuss the latest trends in European capital markets in Q4 2015 and the year as a whole. Who has been investing and where? What is the outlook for the market in 2016? In this webcast we will provide the latest quarterly update to the Cushman & Wakefield Fair Value Index™. Europe still offers plenty of opportunities to invest in commercial property, with 47 of the 117 markets covered in our Fair Value Index rated as underpriced in Q3. In this webcast we will identify those markets that we think look attractive from an investment perspective. We will also discuss the impact of the likely extension of the ECB’s QE programme. Following a strong first half, did third quarter volumes disappoint? In this webcast we will review investment activity over the third quarter and highlight the key trends in investment activity. We will also present our thoughts for the rest of the year and into 2016. Please join Kevin Thorpe, Ken McCarthy and Rebecca Rockey as they discuss September’s Federal Open Market Committee’s decision, the path forward for interest rates, and what it means for the commercial real estate fundamentals. • What is the reasoning behind the Fed’s latest decision regarding monetary policy? • How will the Fed’s decision impact the CRE fundamentals? • How does the Fed’s decision alter our forecast? • What is the path forward for monetary policy and interest rates? • Is the Fed really concerned about CRE prices? On the eve of retail’s biggest annual event, ICSC ReCon in Las Vegas, DTZ proudly presents Retail Real Estate 2015: The New Frontier. Please join us as we take a deeper look at the U.S. retail marketplace in this live, interactive webcast led by Garrick Brown, one of the industry’s most engaging retail real estate thought leaders. 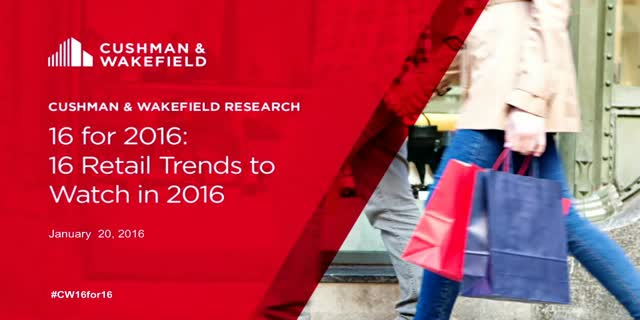 Watch both live and recorded webcasts from Cushman & Wakefield, a leading global real estate advisor.